For more than ten years the Westminster assembly was one of the major institutions of England, Scotland, and Ireland. Members of the assembly were involved in every significant political debate of the decade, and the public blamed or blessed the think-tank for radical changes in the church. At home and abroad, people perceived the assembly to be a powerful patron. Christians wrote from Europe to ask the assembly for advice. Visitors made their way to the abbey, from an unknown Muslim to the elector palatine of the Rhine. Printers and booksellers promoted the works of the synod’s theologians and members were paraded down London streets and feasted at banquets. 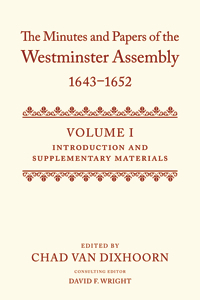 The story of the Westminster assembly’s accomplishments, as well as its failures, are told in the texts of this edition of The Minutes and Papers of the Westminster Assembly. The gathering left behind an extraordinary testimony of its reforming activities, and the manuscript minutes constitute one of the most important unpublished religious texts of seventeenth-century Britain. All surviving votes and debates of the assembly are provided here for the first time. This edition documents almost 2,000 examinations of preachers for churches, fellows for colleges, and heretics for heresy. It also includes all known assembly papers, many of them only recently discovered. These texts reveal much of the assembly’s work behind the scenes, and explain how the gathering could at once serve as an icon of godly rule, producing classic texts in the history of Christian doctrine and practice, while simultaneously becoming entangled in prolonged debates and the ‘democratic anarchy’ which characterized the British Revolution.